Participants in a UK Government-funded project claim to have concluded trials of a new “climbing robot”, developed to undertake detailed analysis of mooring chains in the field. Dubbed RIMCAW (which stands for Robotic Inspection of Mooring Chains in Air and Water), the bot has been designed to hook onto, and move up and down, large mooring chains, from subsea to above-surface. The RIMCAW is equipped with a non-destructive testing (NDT), ultrasonic imaging system, which is used to identify potential and existing defects. The RIMCAW is thus intended to provide a cost-effective and relatively safe means of monitoring the health status of such chains, removing the need to deploy human dive teams, and eliminating the substantial time and cost associated with removing a heavy chain and transporting it to shore for inspection. Monitoring strategies are also challenged by the “dynamic service conditions of both the underwater and atmospheric environments,” the project partners point out. The RIMCAW, TWI adds, “will identify issues such as fatigue cracking as it progresses, and record the scanned data for subsequent downloading and analysis once it has completed its inspection.” The robot has been developed to scan each mooring chain link separately. 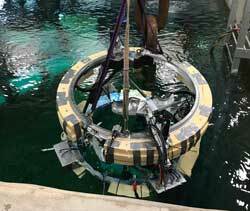 The aforementioned trials saw the RIMCAW deployed at TWI’s dive pool, housed within its facility in Middlesbrough, north east UK. As well as assessing its functionality, the partners were keen to test whether or not the bot could remain neutrally buoyant and watertight across a series of simulated tasks. The next step will be offshore trials, for an added injection of realism, the project partners confirm.